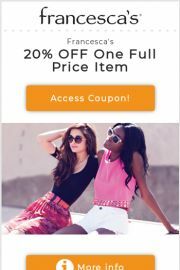 If you’re looking for the best Francesca’s coupons, you’re in the right place! Francesca’s is a women’s clothing chain with an array of casual, playful clothing, plus bags, shoes & gifts. You can shop their stylish selection of dresses and accessories! Besides clothing, they also have unique gifts and even some home decor. With new arrivals happening daily there is always something you will want to see at Francesca’s! When you are looking for unique gifts, the newest styles in clothes, shoes, accessories and more, shop Francesca’s at the Branson Landing! You will be happy you did!